Linux Mint vs Ubuntu: Who Wins the Battle? Ubuntu and Linux Mint are two popular Linux distros available in the Linux community. Ubuntu is a derivative of Debian, and on the other hand, Linux Mint is developed based on Ubuntu LTS. Though both the distros are quite an excellent choice for the newbie and support a wide range of modern devices, still there are some differences for which an array of users may want to compare as Linux Mint vs Ubuntu for digging out the right reasons to choose. Further just describing these distros, I would like to hit the bull of the deciding factor for making a comparison between Linux Mint vs Ubuntu. It helps you as new Linux users or users want to shift from Windows or MacOS and try to get a best OS alternative. In this comparison article, I am not going to start a battle (Linux Mint vs Ubuntu) on finding the answer to the queries of which one is best for newcomers; rather I will show you some overriding factors which will help you guys to fit yourself according to the choices. Before going into the details, I would like to mention for whom this article is developed. A good number of users regularly searches online for “Best Linux Distros for Beginner.” For solving this sort of question, there are not any specific answers because choosing the best distros or OS depends on users need. So there is nothing called – best Linux distro. Best Linux distros for a newbie is asked by two camps. One camp is those who are tech-savvy tweakers, knows a lot about technology, computer and now desire to explore Linux for the first time and likes the concept of open source software movement. On the other hand, there is another camp who don’t know much about Linux but want to install a fresh copy on old hardware to give a new life or want to shift from Windows or Mac and want to get the taste of freedom. These guy doesn’t care about customization or tweaks on Linux, and they want a better and smoother computing experience. Before going to the main discussion, you can check out my latest comparison article on Debian vs Ubuntu. Both the distros are forked of Debian system and have lots of things in common. However, they have approached a different path to fulfill the users need. Linux Mint is trying to be an excellent alternative to Windows OS, and Ubuntu is more about to compete with the Mac system. Besides all these differences, you can make these Linux distros as like as you want with few tips and tricks and that’s the beauty of Linux – ensuring freedom all the way. Now it’s time to deep down into the core of Linux Mint vs Ubuntu comparison and see the overriding factors. Both the system runs on a wide range of devices, but Ubuntu demands a bit more power than Linux Mint. Ubuntu Gnome version offers sleek modern design and stunning visual effects, but Linux Mint is a bit old-fashioned and also runs on both current and old hardware. Ubuntu Gnome requires more power and resources, but Linux Mint demand a bit lower than Ubuntu. Installation methods for both the distros are quite the same and easy. Linux Mint and Ubuntu both support Ubiquity installer method and UEFI. Linux Mint comes with various Linux desktop environment but Cinnamon as default one. This DE is more like Windows interface with the bottom panel, launcher at the bottom left and system notification at the right. You can see all the active app window in the bottom panel. On the other hand, Ubuntu comes with default Unity like Gnome version besides with different desktop environments like Budgie, KDE, XFCE, etc. It provides a common dock-like panel at the right and a top bar consisting of notification area and app window integration panel. You can find all the active app in the dock panel. This dock panel can be moved either bottom or left with a few tweaks via Ubuntu Gnome Tweak Tools. If we discuss the performance for both the Linux distros, Linux Mint will remain ahead of Ubuntu. Ubuntu default flavor is best suitable for modern devices with high-end hardware equipped with. On the contrary, Linux Mint runs smoother on old equipment as well as a current machine. If you want to give life on your old dead laptop, I would like to recommend you to use Lubuntu or Xubuntu flavor. Both the system comes with a complete software management system. Ubuntu Software center seems a bit slower and takes considerable resources to load. 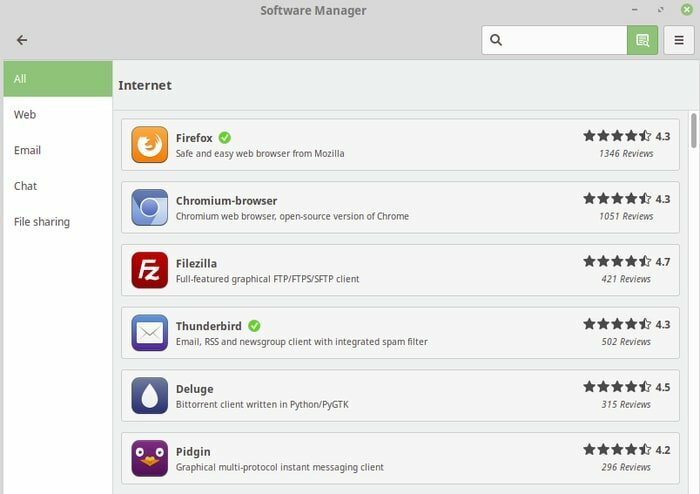 Comparing to that, Linux Mint software manager is fast, quick and straightforward. Both the distros provide various software under different categories which let the users choose the right app easily. Linux Mint and Ubuntu come with a software source tools or manager but the one comes with Linux Mint is far better and offers more usability option for the beginner. Sometimes newbies messed up with the PPA repositories while installing some third-party Linux software. So the choice of resetting PPAs to default one comes handy in this situation. Only Linux Mint shines while offering this resetting options. Moreover Linux Mint has a separate PPA management tab for easy control. Additionally Linux Mint gives an opportunity to fix various common update problem under the maintenance tab automatically. Ubuntu lacks all those nifty helpful options. What new users want to do just after installing any OS? As a new user in the Linux community, you might want to enjoy movies and music, do some office productivity task in words, sheets or excels, web browsing or some photoshop job. All these are fundamental requirements for any users. Linux Mint and Ubuntu both distros come with a set of default productivity applications. However, these distros also lack in some aspects. Linux Mint and Ubuntu don’t come with media codec or adobe flash if you not selected it during the Ubuntu installation process. Ubuntu has a package consisting of all the necessary media codec and flash namely Ubuntu Restricted Extras. However, you will not get it on the software store instead you have to run a command into the terminal to install it. Initially, this process may seem a bit daunting for the new users. On the other hand, Linux Mint also doesn’t come media codec, but it’s easy to find out in the software center. Moreover, Linux Mint offers some best Linux software like VLC, and GIMP preinstalled that Ubuntu does not provide by default. You can install it afterward but still Ubuntu lack behind by giving some essential apps pre-installed by default. 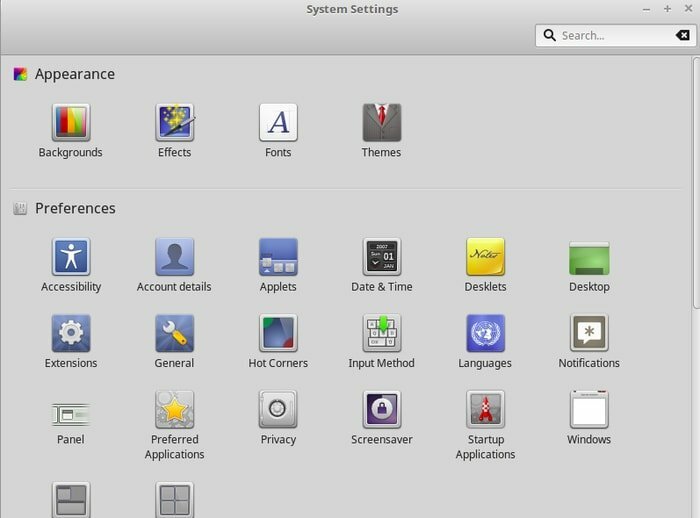 Regarding the beautification of a graphical user interface, Linux Mint does offer a better customization option than Ubuntu. 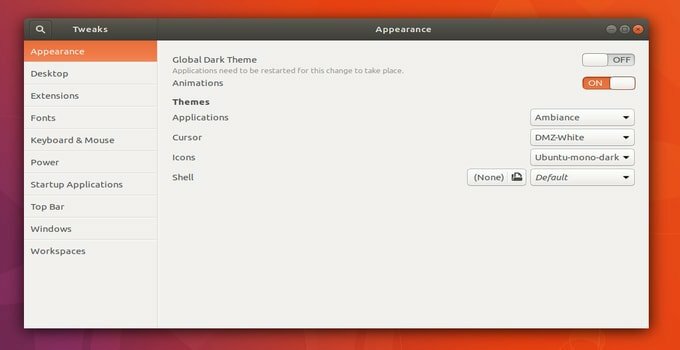 Though installing themes is not difficult on Ubuntu, but still, you need a separate Ubuntu Gnome Tweak Tool for getting more customization options for applying themes and icons. 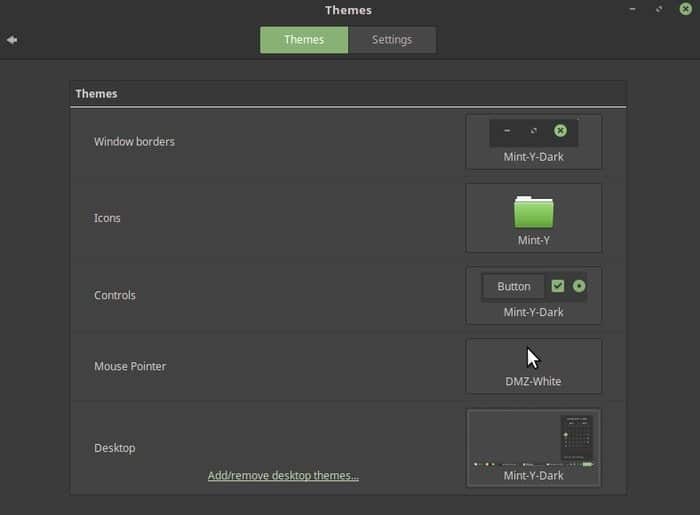 On the other hand, Linux Mint comes with a handful and nice looking community driven themes, applets and desklets preinstalled. In Ubuntu, you have to find Best Ubuntu Themes and Icons on the internet and download a zip file then install to apply. Ubuntu also does not support Linux Mint like applets and desklets like widgets. Linux is impressive in the spare of customization. You can do whatever you want in the Linux system. It let you enjoy the freedom of customization. Ubuntu and Linux Mint are also not lag behind in customization. However, Ubuntu offers some preference, and it’s much more as “what you see is what you get” than Linux Mint. Time has gone a long way, and now both the distros let you modify the system starting from icons, menus, file system, window management and what not. Ubuntu and Linux Mint both come with a set of different flavors. 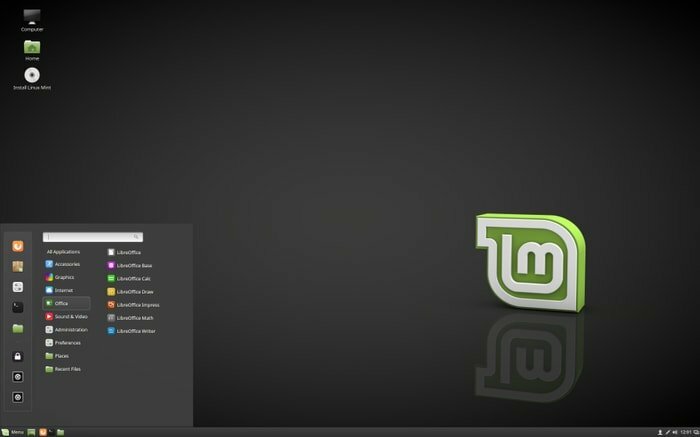 Now Linux Mint supports Cinnamon, MATE, and Xfce desktop environment. Recently it has abandoned KDE development. On the other hand, Ubuntu supports a wide range of Linux desktop environment including Ubuntu Gnome (Default), KDE Plasma, LXDE, Budgie desktop environment, MATE, and Xfce. So in case of various Linux desktop environment, Ubuntu goes ahead of Linux Mint. Both the Linux distros provide a versatile way to update the application and upgrade the system into the latest release. 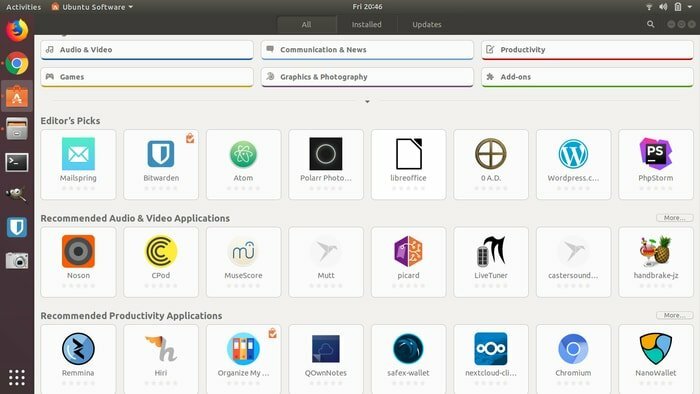 Ubuntu has a software updater utility tool that checks the most recent app and system image release with just a single click. 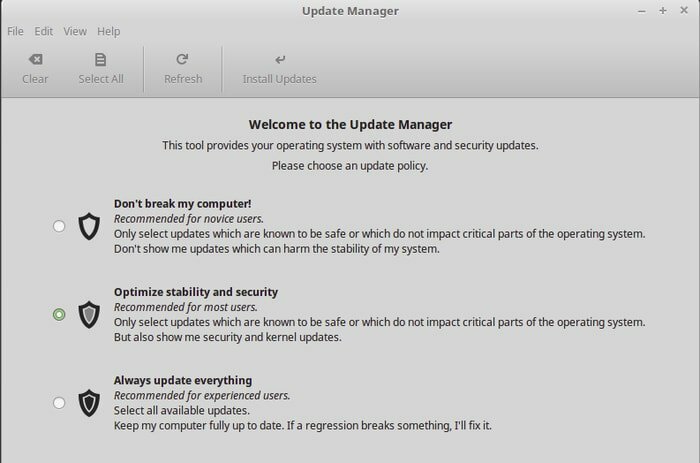 Linux Mint also provides a software updater for its app update and distro release upgrade. Moreover, you can also update the installed Linux software through distro specific software center in Ubuntu and Linux Mint. 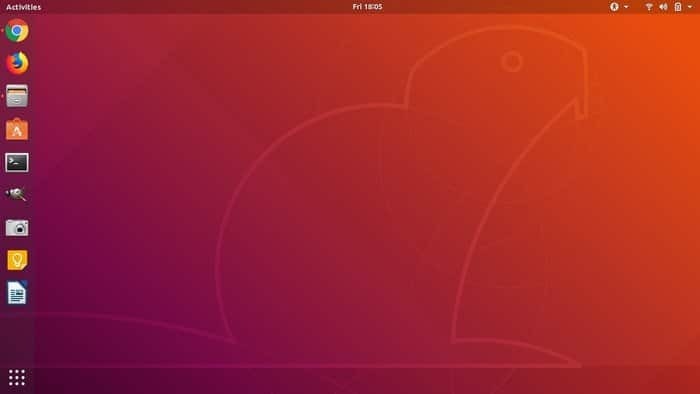 In every six months, Ubuntu releases a new version, and after every two years, It releases an LTS – Long Term Support version. Its LTS supports five years for desktop and server system. So you understand now that Ubuntu system release cycle is scheduled. However, Linux Mint has not planned instead it provides a new version after a few months when Ubuntu releases an LTS version. Canonical is a great company and has made significant efforts to push its Ubuntu into the corporate or business usages. The company is immensely successful in this sector. In this tech world, a considerable portion of the servers are running Linux, and Ubuntu bites a large part of it. Moreover, lots of governmental authority including China, etc. are converting their official system to either Linux or specifically Ubuntu. Furthermore, Ubuntu could convince the PC manufacturer to pre-load its system onto desktops and laptops. On the other hand, Linux Mint is more aimed at enthusiasts. Apparently Linux Mint has not taken any endeavor to push its system into the corporate or business world. However, Linux Mint is polished and capable of replacing any OS or distros for any users. Linux Mint and Ubuntu both the distros will have the same gaming experiences. However, as Linux Mint consumes fewer resources, so running various games will give a bit more performance than Ubuntu. On the other hand, Ubuntu is an excellent choice for modern hardware so that gaming performance will be increased on Ubuntu with less compatibility issue. At last, I can only say, gaming experiences will be more or less the same in both the system. If we discuss the community support, then Ubuntu remains a long ahead than Linux Mint. Ubuntu is backed up and developed by a large corporate company called Canonical and also has a huge fan base and community-driven support teams around the world. Linux Mint also does not lag behind. Lots of community groups around the globe and a group of companies using Linux Mint also act as partners, donors or sponsors for its development. Personally, I like Ubuntu, but I also do not hate Linux Mint. It’s not a hate post towards Linux Mint or Ubuntu. However, a mere discussion and review on which factors do we have to consider while choosing the right Linux distros for the beginners. As a new user, I recommend you to use both of them and try to find out which one fits your desire and needs. Linux Mint and Ubuntu both are very popular in the Linux community and offers a wide range of software compatibility. If you are an MS Windows users, then go for Linux Mint which will give you a known desktop environment to play with but if you are a tech-savvy guy, stick with Ubuntu, as it provides a stunning and sleek system for your latest hardware. What do you think? Is Ubuntu is better than Linux Mint or vice versa? Let us know your suggestions, experiences, and opinions in the comment below. I Have two computers in my Home / Office. Main computer is Windows 7 Pro and the other is Linux Mint. As a Hobby I do a lot of photography and use Photo Shop and Lightroom and they will not run on Linux. I have played with Gimp and it is not in the same league as Adobe products. I also have installed Windows 10 on a laptop and I am not a fan of it at all. I have until January to decide if I have to go to Windows 10 or a Linux Distro. If Adobe would make their products for Linux it would be a no brainier but that is not the case. I have found a program from Corel called Paint Shop that is made for Linux products and it works a little bit better than Gimp but again I favor Adobe products for photography editing. No easy way forward I am afraid. Seeing that Ubuntu is moving away from Unity makes me want to give it another try. I think they are also making headway in the IoT side. Also, I always load Ubuntu 18.04 on any of my Windows boxes using the Windows Subsystem for Linux. This greatly enhances my functionality in Windows. Ubuntu updates where scripts dont point to the new directories are extremely frustrating since it just adds another bunch of steps to troubleshooting. I first used Mint in 2009 i think, and it was way too light for a noob like me but I still played with it for about a month then switched to Ubuntu which was better (at the time) out of the box. Then I found beautifully simple Windows 7 and I went there. I think Ubuntu is making the same mistakes Windows is in the sense that they want everyone to be the demographic. Taking more power away from users to make a hideous gui stay that way. Theres nothing personable about it anymore, if there ever was. Orange/purple migraine colors dont help. Right now im running mint 19 from a live flash and its faster than my installed ubuntu and was able to stream media that I couldnt on ubuntu live disk. And I agree with the above commentor that the Ubuntu community is vastily overrated. My questions are only answered with more questions even though I try to be as nuanced as possible, and then downvoted and lost in eternity behind more difficult questions like “How do you turn on the terminal”…. As soon as im done streaming this video im installing mint and never looking back. How can the derivative be so much faster, sleeker, and smartly designed? Unity destroyed alot of support for Ubuntu, but now you have lots of choice. There is alot of value in ‘out of the box functionality’ especially with Ubuntu/Mint where upgrades can be problematic so better to do fresh install. I think Linux Mint with MATE desktop environment is the perfect office OS duento stability, out of the box functionality and especially with 19.0 just everything seems to work perfectly. As with others, Cinnamon doesn’t give me anything useful, and just uses more resources and used to be buggy. Ubuntu occupies that weird situation as it is itself based on Debian, so it’s difficult to argue that the base system is better. Only thing I don’t like about mint is there are some high level arrogant people on the discussion forum, who admins often support, and they can make it terrible for everyone else. 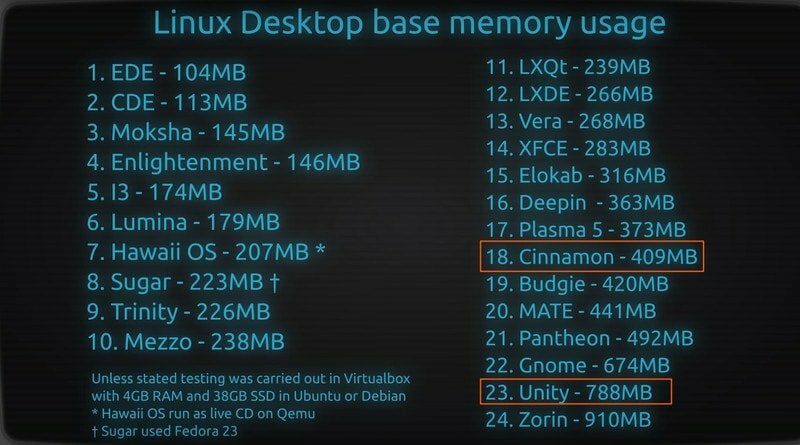 I used to go for all the derivative versions until I realized if I like Cinnamon, as an example, I just hook up my Ubuntu installation to the Mint repositories and install it. Never really understood all us vs them. It’s all great! Mint has never called my attention to try because of the Cinnamon DE style, yet I recommend it sometime for new comings to the Linux world. Which you recommend – Fedora or OpenSUSE? which desktop – gnome or KDE? not sure if the question is for me 😀 but I always recommend Ubuntu/GNOME. Then if the user is not that noob I’d go with Antergos or Manjaro. Because those have been distros that have provided the best experience in all of the aspects for me. The question was for you but I forgot to mention you. Apologies for the inconvenience. I personally have experience of Ubuntu/Mint & would love to check Fedora/OpenSuse. But I’m not much familiar with the arch family. I have never tried Fedora and it is because of the model to lunch new versions they have. With OSuse I had a terribly bad experience, I was starting in Linux and perhaps it was the reason why everything went to a mess. Maybe I’ll try it again in the future now that I have more Linux knowledge. And Arch for me is one of the best out there. Of course, that’s based ONLY in my own personal experience. The MATE desktop is by far the best in mint. I too dislike cinnamon and feel that for ease of use, stability and functionality MATE is better for most people. I think the main reason people don’t use it is because Cinnamon is the default. Once you get used to a DE it’s also difficult to change. I agree with the assertion that Ubuntu is a resource hog when compared to LM. I remember in the early Ubuntu days when it touted itself as a smaller, lighter alternative to the Giants of Windows and MacOS. Such isn’t the case anymore. It is sad to see that severely appealing promise dissolve. Nice comparative article. I used Ubuntu for ~5 years. I hate gnome DE, so I switched to Linux mint 18.3 now 19 cinnamon desktop. In Mint, you can choose wallpaper slideshow right from settings which I never found working in gnome tweak tool. Few keyboard shortcuts in Mint are duplicated & you need to select the action whereas it’s easy in Ubuntu manually. When you select properties of say music files, it doesn’t provide details like the artist, album in that field which you get to see in Ubuntu. Dist upgrade is easy in Ubuntu while I had a painful experience in Mint 18.3-19! I find Mint easy to use currently with a not significant difference between both. I thought OpenSuse & fedora before choosing Mint, but I wasn’t convinced as felt both are crazy to install & use from a non-geeky view. You do realize you can change DE without changing distros, right? I don’t mean that to be snarky, just legitimately curious. Yes, but when I installed Ubuntu 18.04, I felt it wasn’t that good to use like 14.04/16.04 & I faced some problems with 16.04 LTS. At that time I wasn’t well versed with different DEs. So I just changed distro. I still love Ubuntu esp 14.04,16.04 LTS but not willing to go back as I would need to reinstall a few apps. I would do that if I change my distro eg Fedora or OpenSuse which I may do after a lot of study & double checks. I am loving Linux mint cinnamon and there is never been faced any problems, in the case of Ubuntu display problems are the first one to be encountered and after finding out the workaround you will face another problems which are really troublesome. So in my opinion Linux mint is the best distro. I use Linux Mint 19 and 18.3, both work well, I have used Ubuntu, and some lighter distros on the Raspberry Pi and Asus Tinker Board. For me it comes down to the target architecture, and since I have all older machines that are resource constraint I like the Mint distro, but if I was to get a new machine I would be installing Ubuntu. That said I do find most of my queries answered on the Ubuntu forum or Stack Overflow, anyhow I hope my 2 cents helps someone ? I have to disagree with your position in regards to the community aspect. I tried switching from Windows to Ubuntu almost 8 years ago. I would post questions on Ubuntu forums and almost every one went unanswered. I ended up going back to Windows. Mind you, I’m a fairly tech savvy user. I search forums for answers to questions before I ask. Fast forward to about 2 years ago, I decided to try out Mint. I ran into similar problems as I did with Ubuntu. The only difference was that the community answered closer to 95% of my questions. I haven’t touched Windows since. On top of that, since people have answered my questions, I’ve learned a lot about how Linux works and have, in turn, helped a few people on the forums along the way. And now that I’m more comfortable with the file structure, kernels, update processes, package managers, etc, I’ve started experimenting with Arch and Fedora. The bottom line is Mint definitely has a much more active, albeit smaller, community.